On a bad day the Atlantic Ocean can be a miserable place. Resilient coastal dwelling Nova Scotian’s know it well, embracing their Atlantic shore when the weather’s good, bunkering down indoors when it’s not. Her jagged coastline, unpredictable weather and proximity to busy shipping lanes have resulted in the greatest assemblage of shipwrecks in North America. That, despite a plethora of navigational lights and beacons along her shores. Captain Edward Smith had one of the worst days imaginable when the ship he commanded on her maiden voyage struck an iceberg mid-Atlantic, sinking with the loss of 1500 lives including his own. A hundred years ago Snow’s Funeral Home in downtown Halifax occupied the building that now houses the city’s finest restaurant Five Fishermen. Snow’s became a makeshift morgue as bodies from the RMS Titanic were brought ashore amidst an overwhelming cloud of grief. More recently Captain Robin Walbridge, Master of HMS Bounty also found himself contending with a ferocious Atlantic Ocean as 2012’s Hurricane Sandy approached the North American east coast. 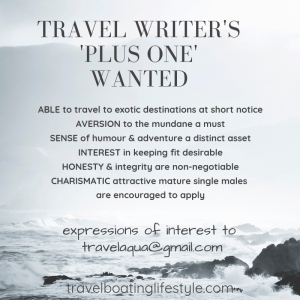 His body was not recovered, presumably drowned when HMS Bounty foundered. Nova Scotian’s mourned this maritime tragedy too. A replica of the 1787 original, HMS Bounty was crafted by skilled Nova Scotian shipwrights at a shipyard in Lunenburg, a historic UNESCO World Heritage maritime village not far from Halifax. 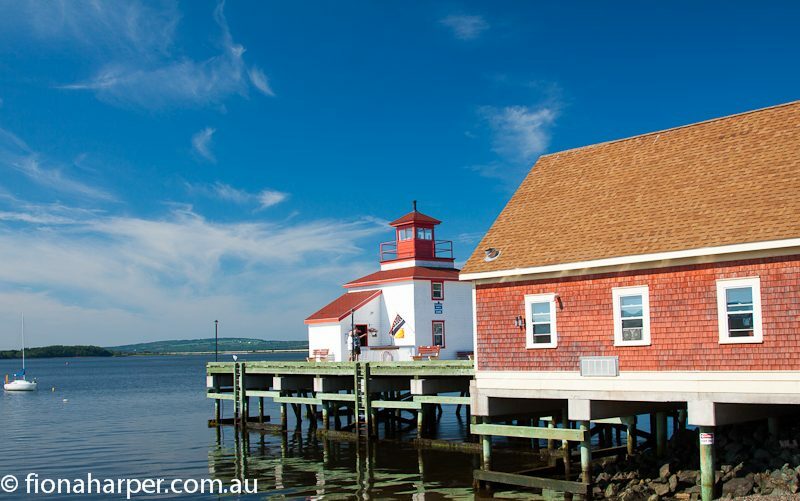 If you’ve any interest at all in maritime or architectural history, this waterfront hamlet is worth crossing oceans for. Bunker down in the Lunenburg Arms and its likely, just as countless sea captains did before you, you’ll want to drop anchor permanently on this North Atlantic shore. The same shipyard that built HMS Bounty also built Canada’s much-loved schooners Bluenose, known as the ‘Queen of the North Atlantic’ for her ability to make swift ocean passages, as well as her much-loved replica Bluenose II. The original Bluenose appears on the Canadian dime while her replica is used as a living sailing museum to promote the maritime history of Atlantic Canada. Recently relaunched after a major refit, Bluenose II still relies upon the historic lighthouses that have guided mariners along Nova Scotia’s Atlantic coast for centuries. 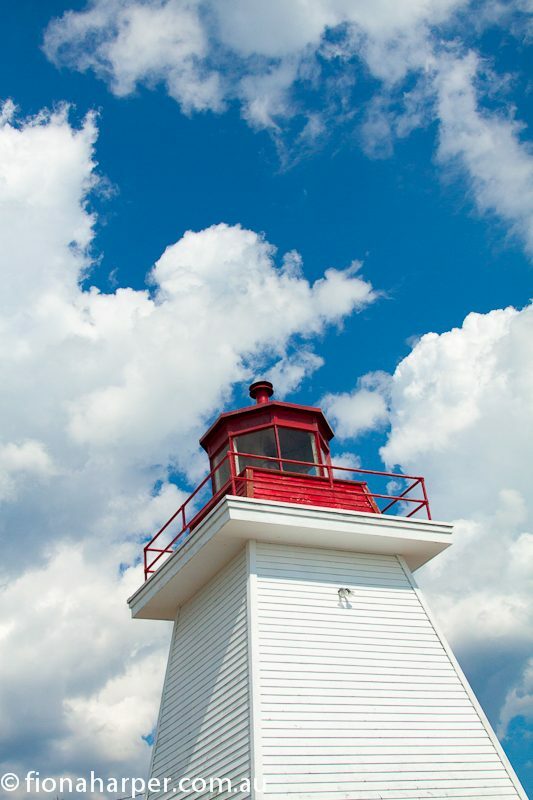 According to the Nova Scotia Lighthouse Preservation Society, there are around 150 lighthouses dotted around Nova Scotias 7400km wave-carved coastline (by comparison that’s approx. half the length of New Zealand’s coast). Some of them, like the unfortunately named Coffin Island Light (flashing white), ignited in 1812 and replaced in 1914 with the current tower, have almost as many stories to tell as the ships that pass by in the night. Lighthouse keepers made a fairly tough career choice. Living in isolation, their lives were ruled by the daily burden of keeping the flame ignited from sunset to sunrise. Intrepid lighthouse keeper’s wives had it no easier, often raising families in far-flung isolated coastal outposts. Coffin Island keeper Thomas Eaton’s wife had it harder than most, her grief presumably suspended as she stepped into head lighthouse keepers role after her husband drowned sailing to Liverpool for supplies. Some of Nova Scotia’s historic lights have become major attractions thanks in part to romantic notions attached to these structures. More likely though it’s because they are often situated in ridiculously picturesque locations. 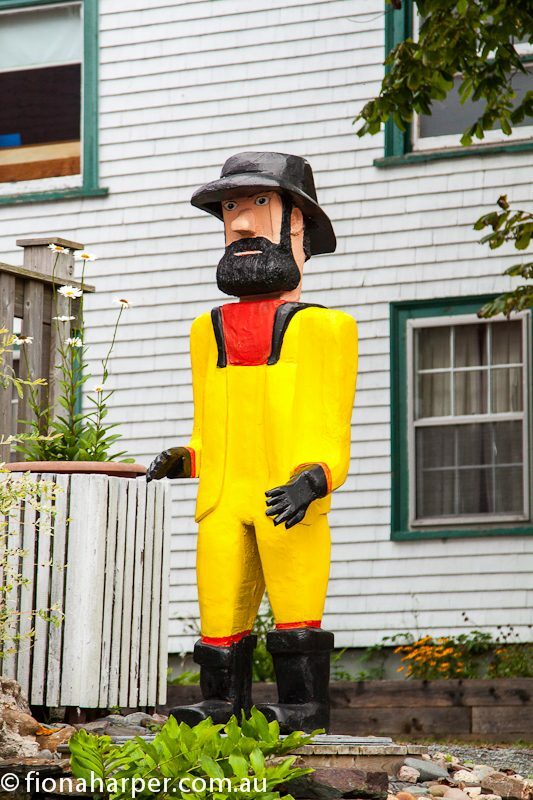 Guarding the entrance to Margaret’s Bay midway between Halifax and Lunenburg, Peggy’s Point Lighthouse (fixed red) overlooks Peggy’s Cove, a teeny fishing village with oodles of charm. 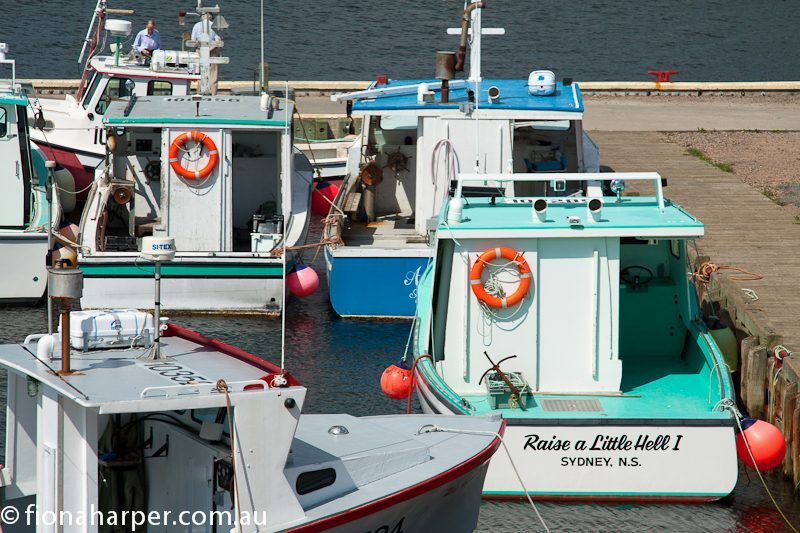 A pretty harbour is circled by clapboard homes on top of the hill while down at sea level, boatsheds and docks are draped in the tools of fishermen’s trade. Fishing boats await their next voyage, tethered to weathered docks piled high with lobster pots, rope coils, floats and dory’s. Chester is another pretty fishing village that’s mostly pretty quiet. Except in August when Chester Race Weeks lures sailors and their yachts for a week- long celebration of sailing on Mahone Bay. Washed by the fertile North Atlantic Nova Scotia is known for its seafood. Seafood chowder is a menu staple across the province; chock full of lobster, crab, mussels, fish and scallops. I’m not suggesting for one minute that you get your lobster fix at McDonalds, but, indicative of how prolific the seafood is, Nova Scotia is the only place in Atlantic Canada where you’ll find a McLobster burger. 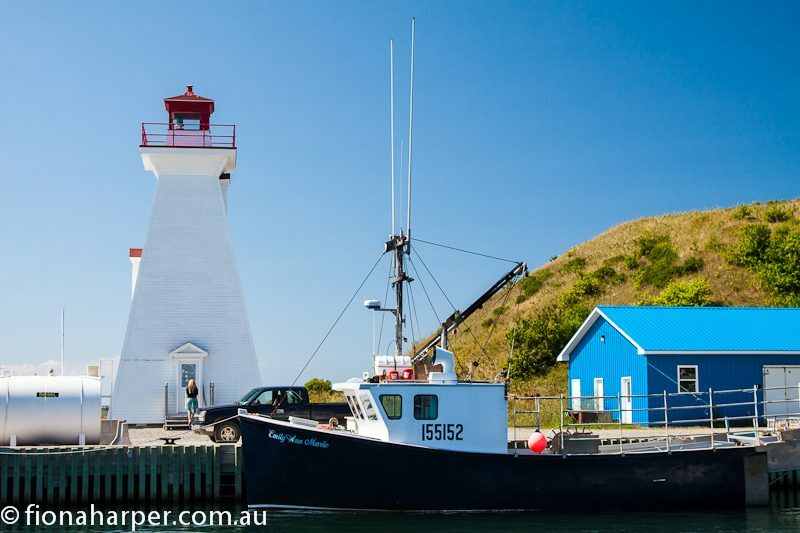 Fortunately there are far superior opportunities for trawler fresh lobster cooked to perfection, like at Baddeck Lobster Suppers on Cape Breton Island or Pictou Lodge on the shores of Northumberland Strait for example. Tough lobstermen ply North Atlantic waters trawling and hauling their catch which are exported across the globe. On the north coast at Pictou the Northumberland Lobster Hatchery offers an intriguing insight into the life cycle of a lobster. For a couple of dollars visitors have the opportunity to release hatchlings into the wild in a touching sort of ‘fly be free moment’. It’s quite a worthy gastronomical investment before heading off to lunch or dinner for more lobster! While the Atlantic Ocean can be formidable, it has her fair share of absolutely splendid days too. Like the morning I stand on Lunenburg dock watching a sailor row his clinker dinghy ashore. A perfectly breathless morning, I watch his graceful bow create gentle ripples on an otherwise mirror-like sea. The reflections are so acute I feel lightheaded as my brain computes what is real and what is not. Glancing towards the shore, brightly painted clapboard boatsheds are perfectly reversed creating a reflective sea of colour. Yardarms and masts, booms lashed with sails above tall ship decks seem to be suspended in the inky blackness. As the sailor reaches the dock I watch mesmerised as oily ripples dance across a distorted painted sea. It’s not at all what I expected from the North Atlantic Ocean. Fiona Harper was a guest of Canadian Tourism Commission.